A look through our site indicates pretty quickly that we’re no stranger to fashion. From the early days of Matisse shoes to lunch bags and protective gear, if you can wear it, we’ve worked with it. We’re also pretty pro when it comes to startups and small companies working to figure things out. We love strategy and helping brands grow into something they can be proud of, and usually, we’re pretty proud too. So, when Mike met Gordon McDougall at an investor meeting in Pasadena, he thought Gordon’s business model sounded like a great fit for Echo-Factory. Think perfect storm. Gordon explained that Bitzio, a mobile app company, was transitioning into a fashion acquisition company. The plan was simple: find emerging apparel brands with a few years of success behind them, but with capital and resource barriers that prevented growth. Then, help these brands grow into strong voices within the fashion industry. He wanted to make fashion a democracy, where there is strength in unity and sustainability through diversity. Gordon built a team of experts and transformed a struggling mobile app company into a fashion apparel acquisition company that is certain to disrupt the industry as we know it. Sounds pretty great, right? It gets better. Luckily for us, Bitzio needed an marketing agency. So we got to work. 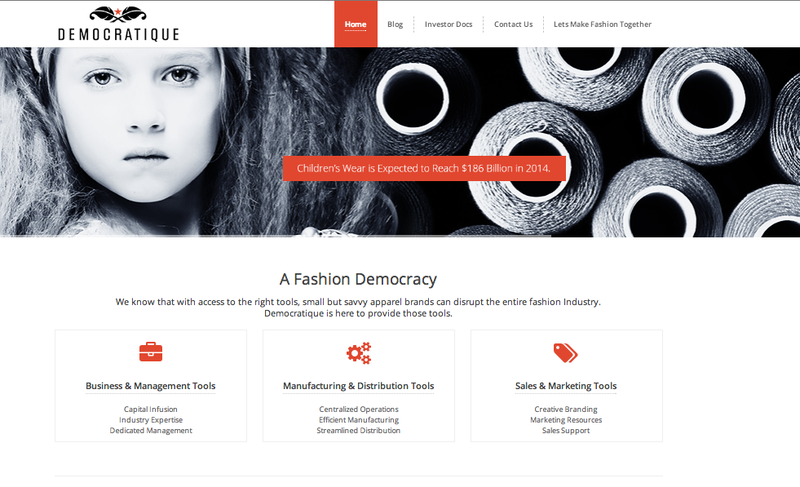 We came up with a new name: Democratique, fashion brands for the people, by the people. Then we built a website, gave them a fresh new logo and tagline and helped write some relevant blogs. Things were coming together pretty quickly. When we learned Bitzio was planning to head the LD Micro Conference to announce the launch of Democratique, we knew it was the perfect opportunity to get the word out. So we designed some collateral material, including postcards and brochures.